Posture is so much more than just looking poised and more confident. Having correct posture while standing and sitting allows our bodies to function more properly. This article will discuss posture and how to improve yours, starting today! What’s so bad about poor posture? Even though poor posture can make you look less sharp than normal, it’s also terrible for your health. It causes bad circulation and also be the source of vertebrae deterioration over time. Being active with bad posture can be horrible for your muscles and joints. It can limit your activity because muscle and joint pain paired with poor circulation leads to early exhaustion. Neutral positions relax the body, while bad positions put too much strain on the body. It can cause pain your shoulders, neck, and can even cause headaches! Bad posture is more likely to cause herniated discs, and 25% of people with back pain suffer from this excruciating ailment. The bottom line is that poor posture causes misalignments in your body, which can negatively affect your muscles, bones, and limit your range of motion. What causes bad posture? Although bad posture is not always a sign of laziness, the United States have an increasing number of weight issues which can change how our bones and muscles support the rest of our body. People who are overweight tend to be less active, also leading to an increased risk for disease. Unsupportive shoes, genetics, and stress can all also be triggers to poor posture and weight problems. If you have been in an accident, have poor lumbar support or an unsupportive mattress, your chairs are too high or low, or you have weak muscles, it is more likely than now that you have poor posture. Unfortunately, it can be an incredibly vicious cycle. 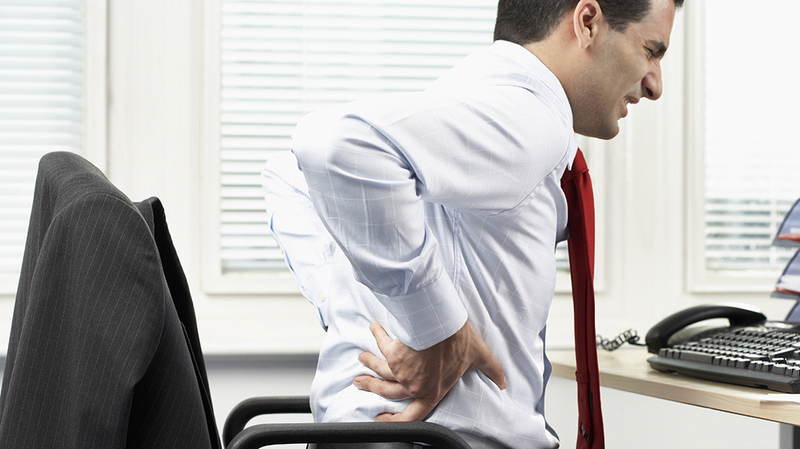 Poor posture leads to back pain, which leads to even worse posture, causing even more excruciating pain. Learn how to have great posture in every position. Grasping the idea of good posture can help you realign your body correctly. You can do a quick at home (or office!) test to check your posture. First, stand up with your back of your head against the wall. Then, place your heels about 6 inches from the wall, with your bottom and shoulder blades still touching the wall. Measure the length between your neck or the small of your back and the wall. If there is less than a two inch gap, your posture is okay! A larger gap, however, can indicate poor posture and also a curving spine. When you are sitting, keep these tips in mind: Keep your head straight, not down or tilted. Sit with your knees slightly lower than your hips, and try to relax your back and shoulders. Be sure your feet are flat on the floor, and do not tuck your feet under your chair or cross your legs. When you are standing, be sure to keep your shoulders and back aligned. You can also use your stomach muscles to make sure you are straight. Slightly bend your knees to release pressure from the hips and wear quality shoes. When walking, make sure your chin is parallel to the ground and walk from heel to toe. Do not look at your feet or arch your back. When running, don’t forget this: Keep your head up and always look forward. Lean slightly forward and hit the ground with the middle of your foot before rolling onto the toe. You can also get better posture when sleeping. You can use a firm mattress that can provide you with more support. Stretching before bed will also ease your muscles and keep them from getting tense. Visiting your Doctor of Chiropractic is always a good idea to get more tips and tricks for better posture, how to avoid bad habits, and to help your body stay aligned correctly.